I love hats. Primarily because I have crazy, uncontrollable, half-curly, half-straight hair that occasionally needs to be covered up. The problem as the weather gets warmer is that sometimes I have to choose between letting everyone see my horrible hair and having a sweaty head under a hat. So my goal with this hat was to create something fun that I could still wear in warm weather. 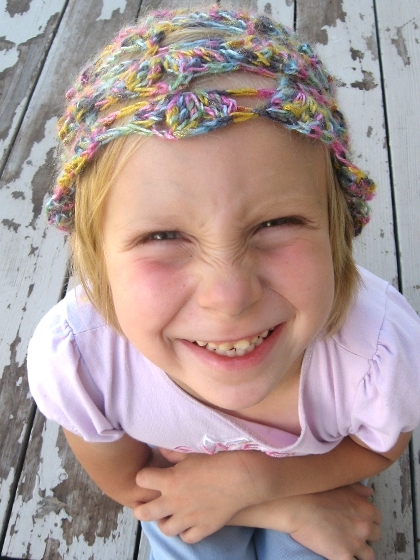 The pattern is simple enough to show off the fun yarn without being boring. It is also incredibly stretchy, so the sizes given should fit from children to adults. V: Dc, ch 1, dc in same ch or space. begcl: (beginning cluster) Ch 3. 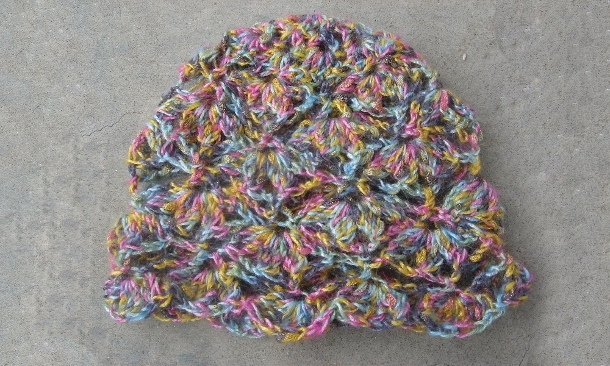 *Yarn over twice and insert hook in same stitch, pull up loop, yarn over and pull through two loops twice. * Repeat from * to * once, yarn over and pull through all three loops on hook. trcl: (treble cluster) *Yarn over twice and insert hook in same stitch, pull up loop, yarn over and pull through two loops twice. * Repeat from * to * twice, yarn over and pull through all four loops on hook. Note: Hat is very stretchy, so when in doubt, go with a smaller size. Should be worn with at least two inches negative ease. To begin, ch 6 (6, 7). Sl st in ch furthest from hook to make a ring. Rnd 1: Ch 2. Make 20 (24, 28) dc in ring; sl st in first dc to join. Rnd 2: Ch 3 (counts as dc, ch-1); dc in same stitch. *Skip next stitch, V in next stitch. Repeat from * around; sl st in second ch of ch-3 to join. Rnd 3: Sl st into next ch-1 space, ch 2 (counts as dc), make 2 dc in same space. *Make 5 dc in each ch-1 space; repeat from * around. Make 2 dc in beginning space, sl st in starting ch to join. Rnd 4: Begcl, (ch3, trcl) 3 times. *Dc in third stitch of next dc group. In third stitch of next dc group trcl, (ch3, trcl) three times*; repeat from * to * around. Dc in third stitch of next dc group; sl st in begcl to join. Rnd 5: Ch 3 (counts as dc, ch-1), dc in same stitch. *Ch 5, dc in center ch-3 space of trcl group. Ch 5, V in dc. * Repeat from * to * around; ch 5, dc in center ch-3 space of trcl group. Sl st in second ch of starting ch to join. Rnd 6: Sl st in ch-1 space of V; begcl, (ch3, trcl) three times. *V in dc; trcl, (ch3, trcl) three times. * Repeat from * to * around; V in dc; sl st in begcl to join. Rnd 7: Sl st into nearest ch-1 space; begcl, ch 3, trcl. *Ch 1, dc in center ch-3 space of next trcl group, ch 1. In next ch-1 space trcl, (ch 3, trcl) 3 times. * Repeat from * to * around; ch 1, dc in center ch-3 space of next trcl group, ch 1. In first space, trcl, ch 3, trcl. Dc in begcl to join. Rnd 8: Ch 7 (counts as dc and ch-5); *V in dc, ch 5; dc in center ch-3 space of next trcl group, ch 5. * Repeat from * to * around. V in dc, ch 5; sl st in second ch of beginning ch to join. Rnd 9: Ch 3 (counts as dc, ch-1), dc in same stitch. *In ch-1 space trcl, (ch3, trcl) 3 times; V in dc. * Repeat from * to * around. In ch-1 space trcl, (ch 3, trcl) 3 times; sl st in second ch of starting ch to join. Rnd 10: Repeat Round 7. Rnd 11: Repeat Round 8. Size Small and Medium: Skip to Round 15. Rnd 12: repeat Round 9. Rnd 13: repeat Round 7. Rnd 14: repeat Round 8. Rnd 15: [Begcl, (ch 2, trcl) 2 times, ch 1] in first dc. *In next V or dc, [trcl, (ch 2, trcl) 2 times, ch 1]. * Repeat from * to * around; sl st in begcl to join. Fasten off. Finishing: Weave in ends, block gently. Kim learned to crochet as a child, but it never really took until she got stuck working the night shift at a hotel front desk. Yarn filled those long quiet hours quite nicely! She currently lives in Colorado with her husband and three little girls, where the harsh winters inspire her to create all manner of warm woolen goodness. When not completely overwhelmed by her urge to do it all, she gardens, spins, and reads comic books. You can see more of her designs on Ravelry! Pattern & images © Kim Driggs. All rights reserved.